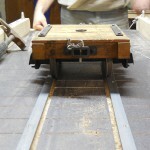 I cut some timber down to make the ties which are 4mm higher than the normal ones, to negotiate the higher rim of the turntable pit. 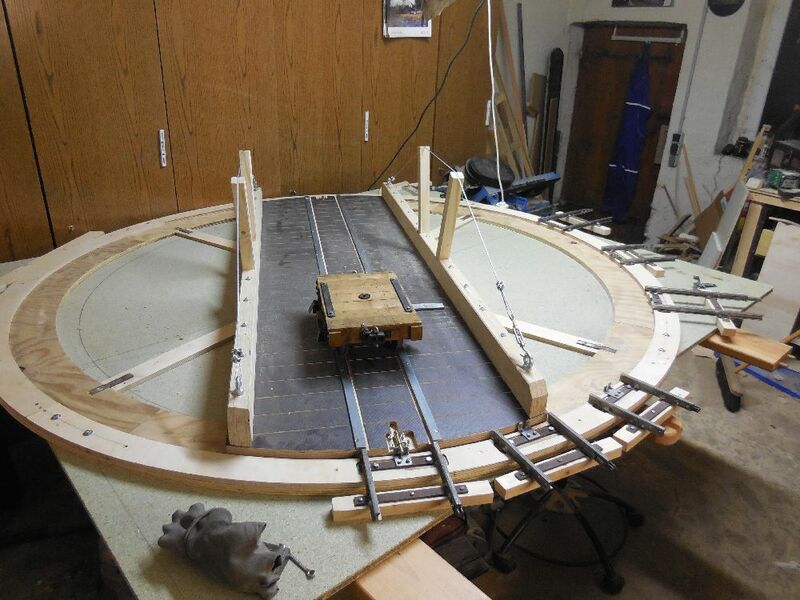 The next piece of track will be on a slide grade to go down to the standard track level. 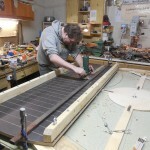 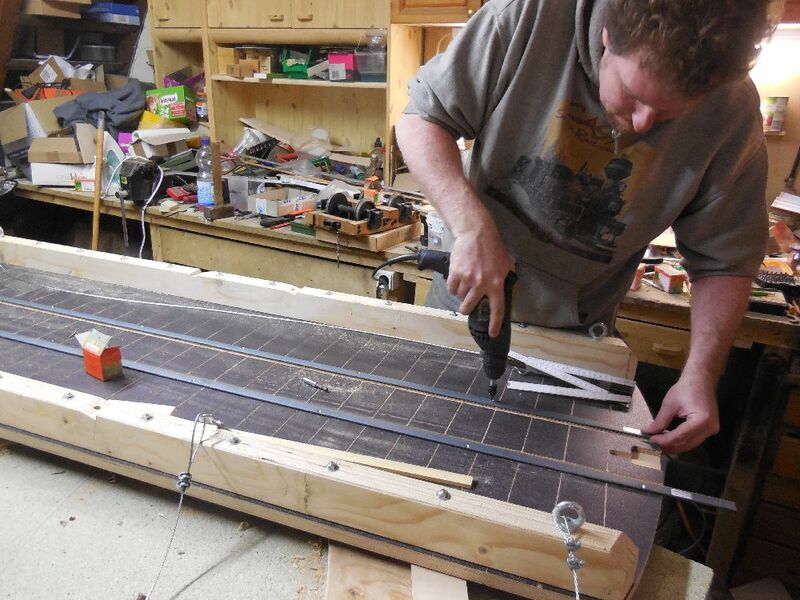 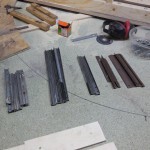 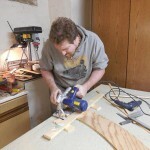 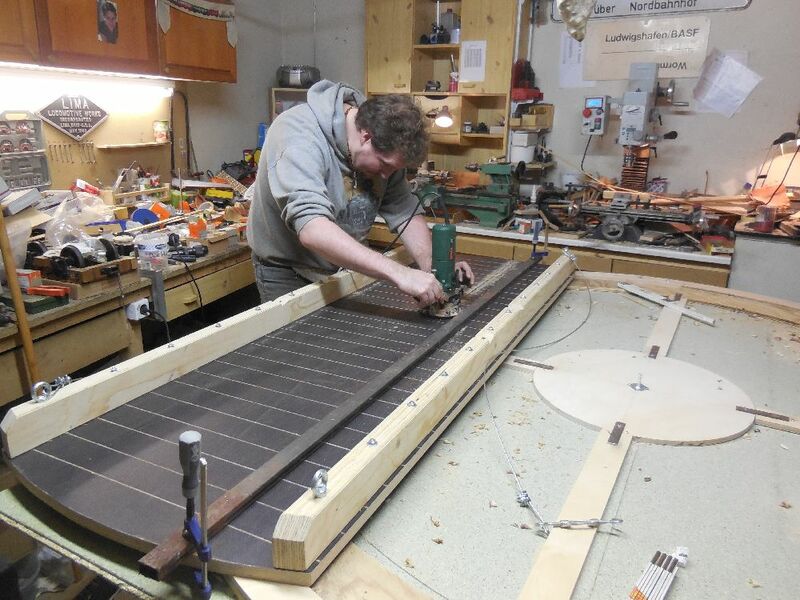 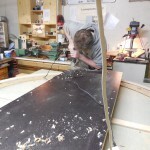 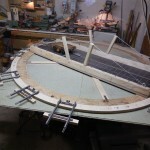 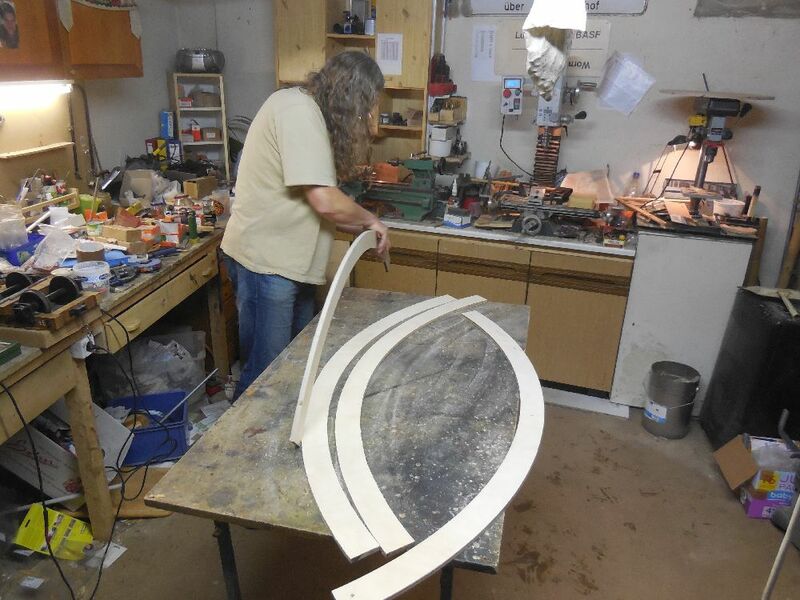 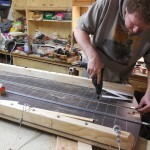 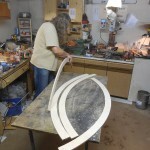 Next step was again – making jigs and templates. 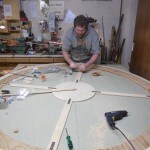 Investing time in good templates makes work much easier in most cases. 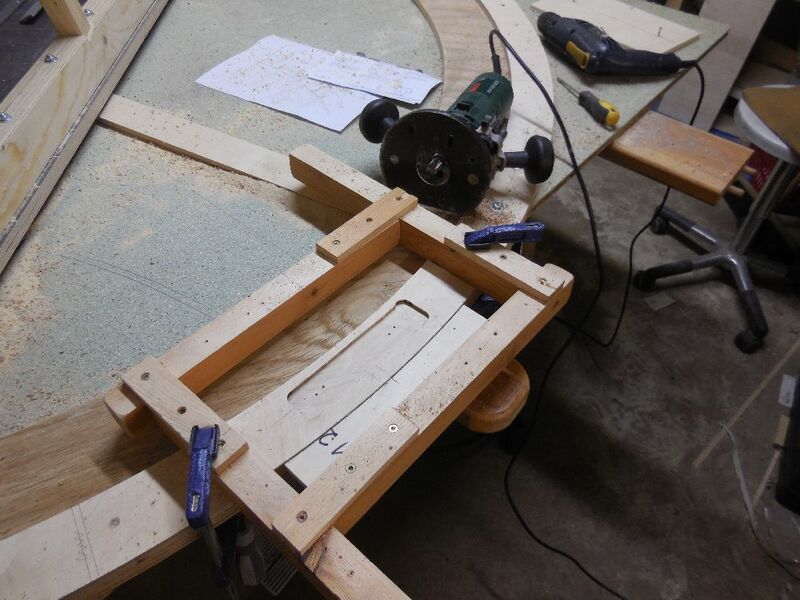 I made the frame for my router when I cut the windows in my combine side walls and once I set up the frame to the needed dimension, I added a piece of plywood, matching with the rim of the pit. 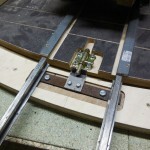 So it was very easy to align the jig properly on the rim to cut out the pockets for the connecting tracks. 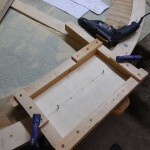 I made a drilling template from plywood that fitted into the router frame to pre-drill the mounting wholes all the way through. 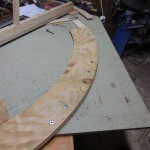 One the pockets were made, I flipped the segments over and made a recess to the bottom with a 25mm Forstner bit. 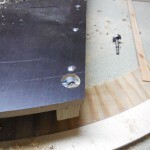 The 2mm pilot hole works well as center for the Forstner bit. 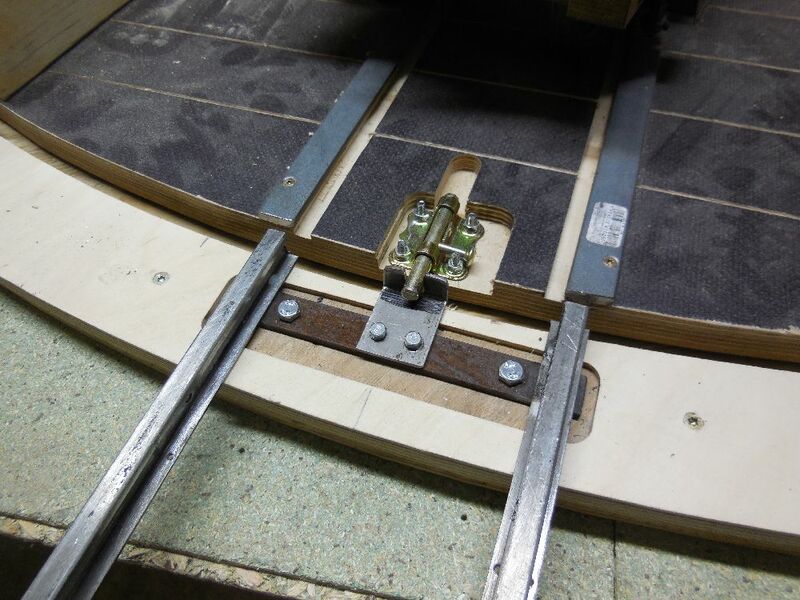 After drilling the holes to final 8mm, I added the M6 inserts. 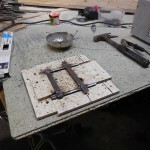 All that was missing by now were the counter parts of the turntable locks. 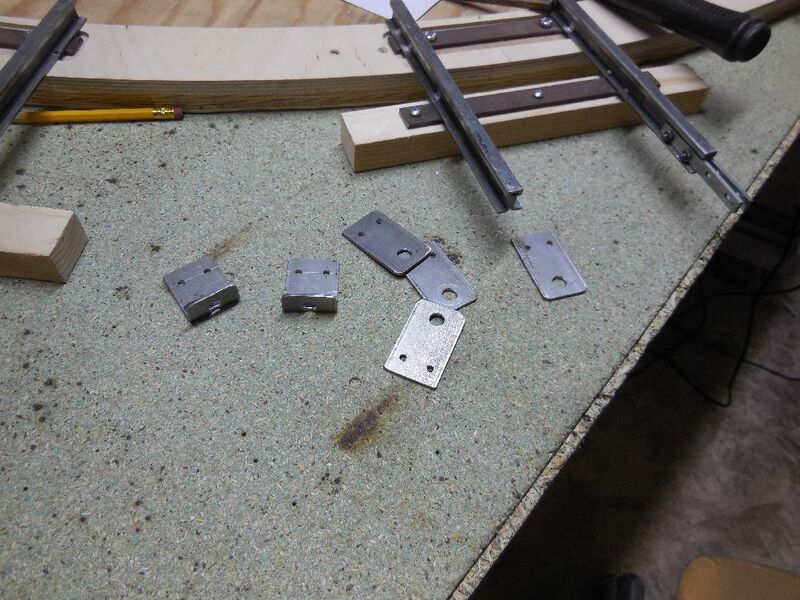 Since I had no matching steel angle on hand, I cut some pieces from 2×30 flat bar and made my one angles as needed. 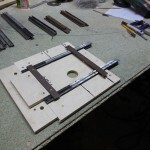 After bending, I cut the 8mm holes into slots for the bolt of the locks. 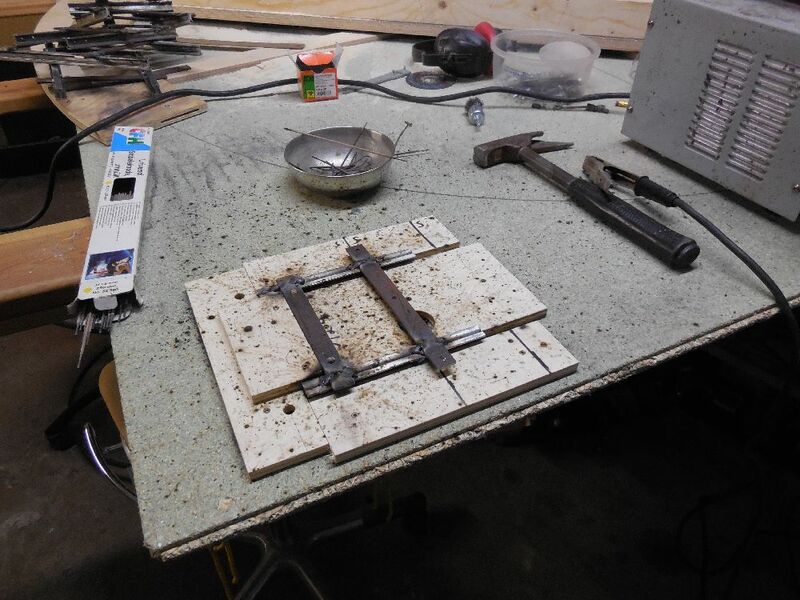 I screwed the angles to the steel tie on the connecting tracks and aligned them with the turntable. 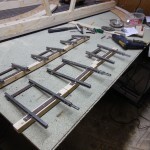 Since these parts are one unit, you don’t have to spend alignment work in future (hopefully). 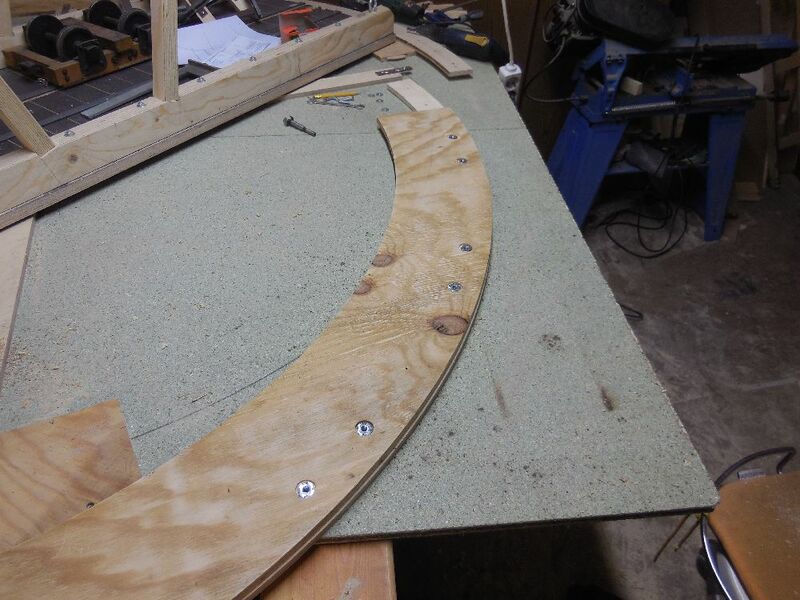 Once all tracks are installed, I tested each one with both ends of the turntable, did some adjustments here and there and finally I chamfered the track heads a little bit to avoid any derailment. 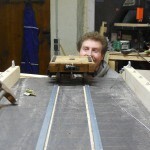 I could spend another 1.5 hours in the workshop today and started work for the connecting tracks. 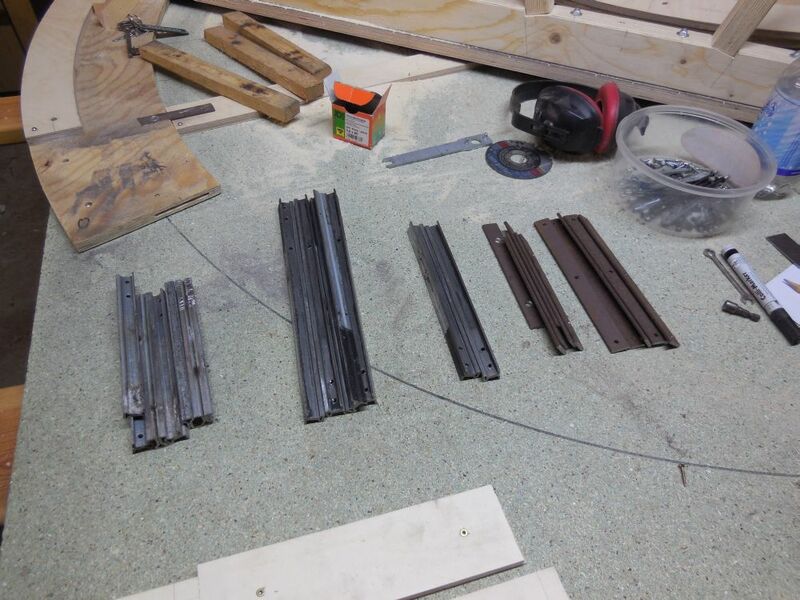 I collected some rail from the scrap box and cut them to length. 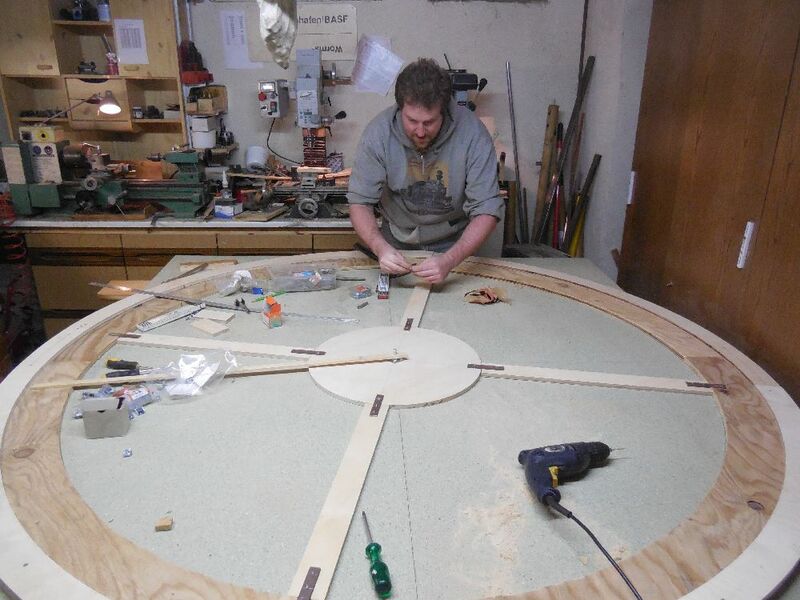 The shortest ones will be used for the roundhouse tracks, the others are for the station tracks. 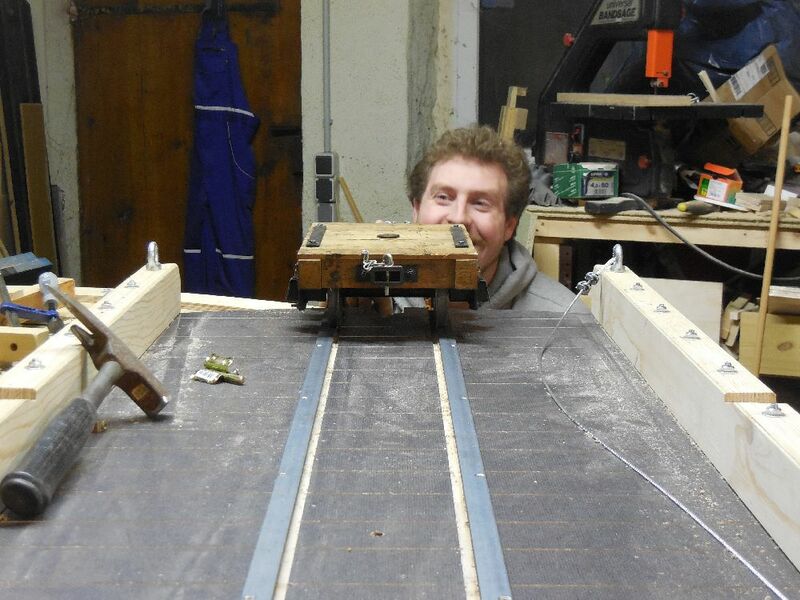 These have two different length to fit into the track geometry. 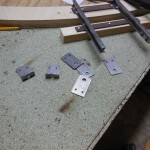 I also cut helper ties from flat steel bar and drilled the holes for the wooden ties. 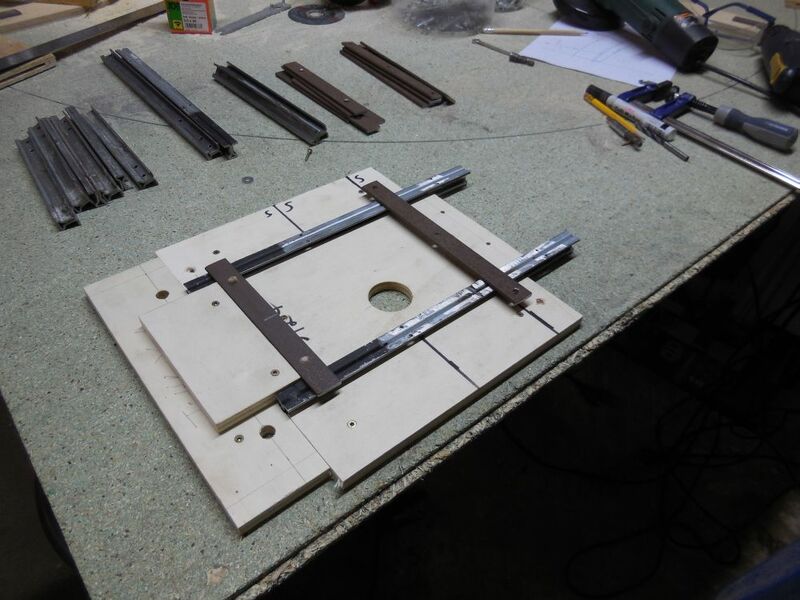 At least a made a welding jig, in which I’ll weld the 6 short pieces of track together during the next days. 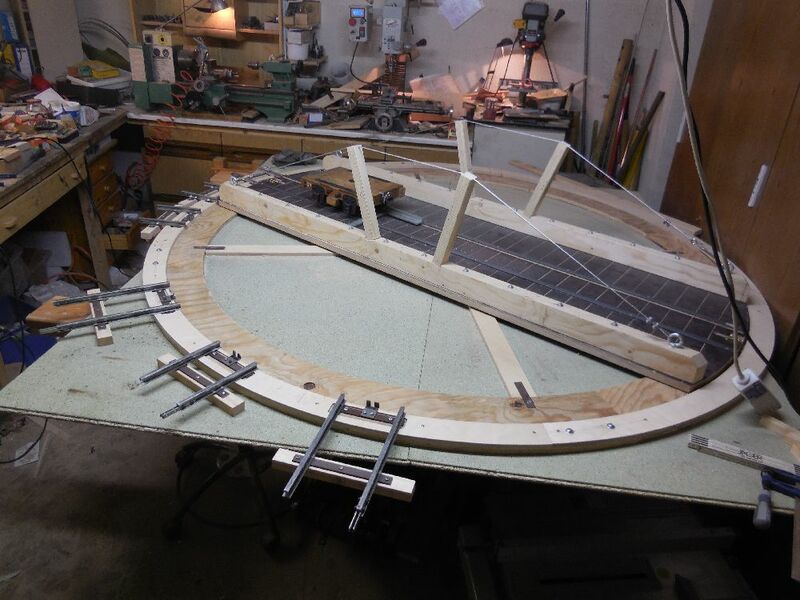 today, we made major progress on the turntable. 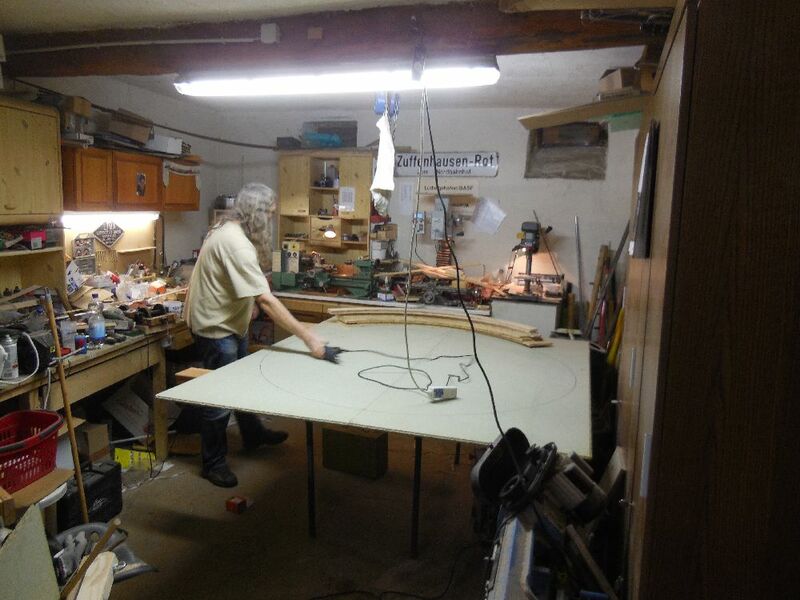 Last weekend, Martin delivered the wood parts for the turntable pit as promised. 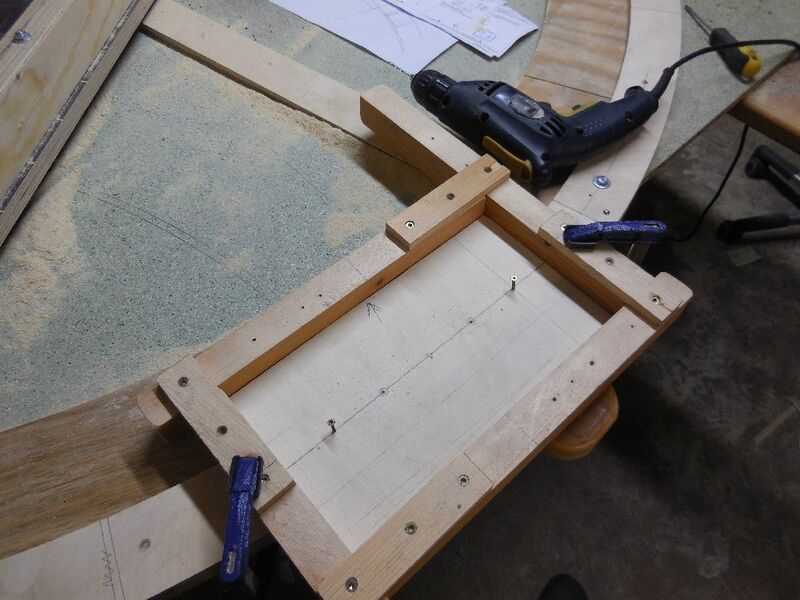 We sanded the parts and checked them for correct measurement. 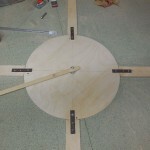 We found out, that the angle of the quarter circles was not perfect. 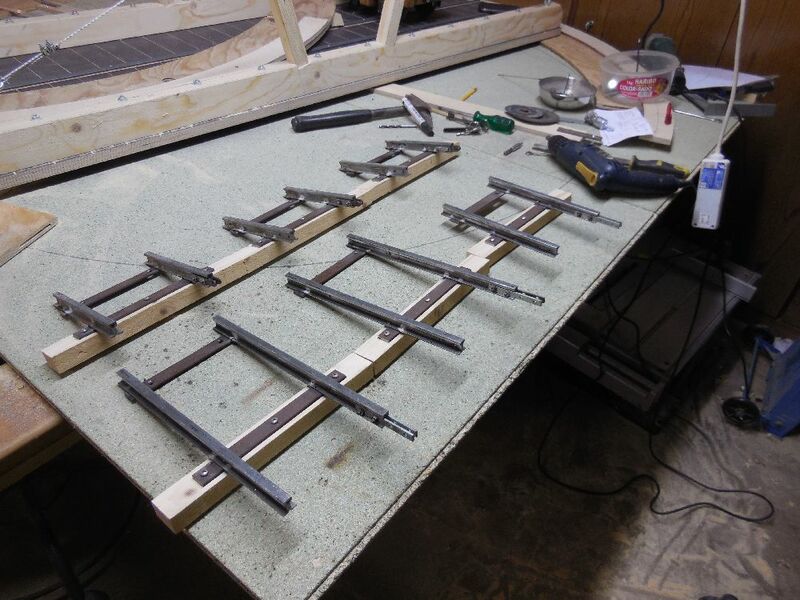 We made a jig and cut them to correct length. 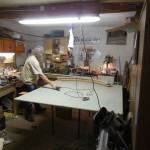 We also made a temporary table on which we can build the turntable. 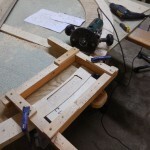 The wooden table also allowed us to secure parts with screws and to keep everything aligned during construction. 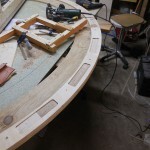 Once the lower ring was fixed, we glues and screwed the upper ring on top with a 20cm overlap on one side. 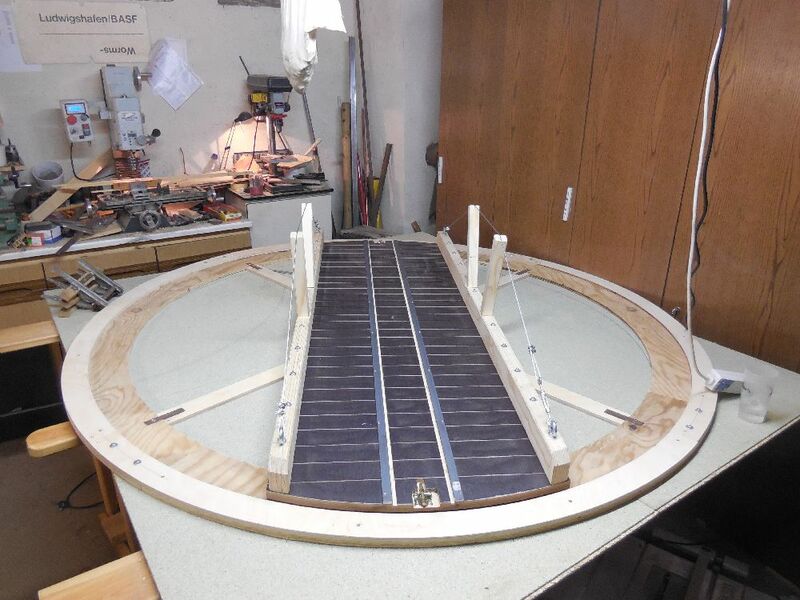 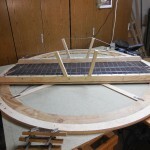 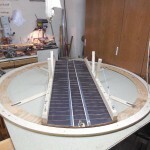 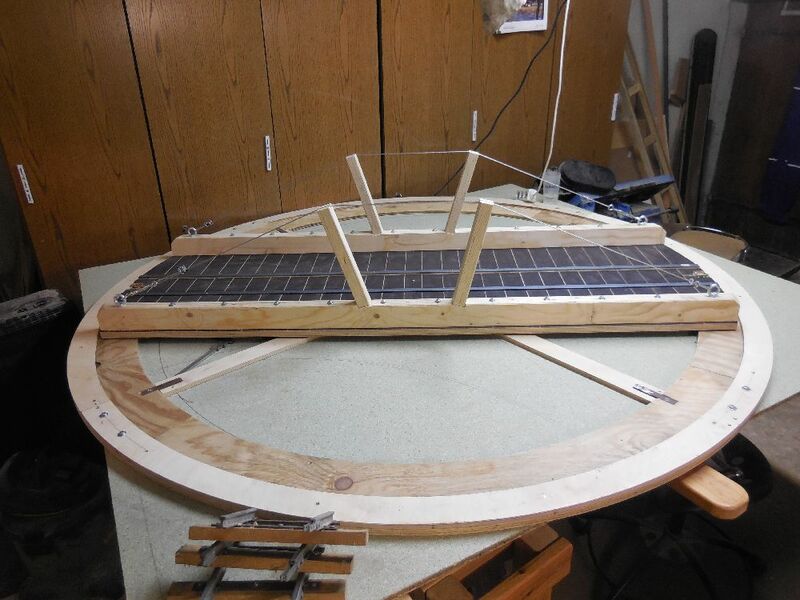 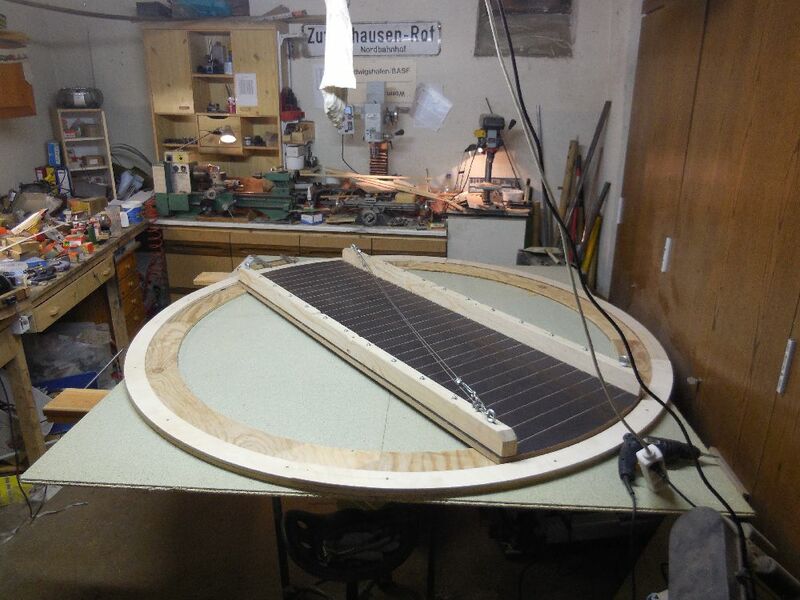 Next we made the center plate with the pivot point and added 4 spokes to keep everything together. 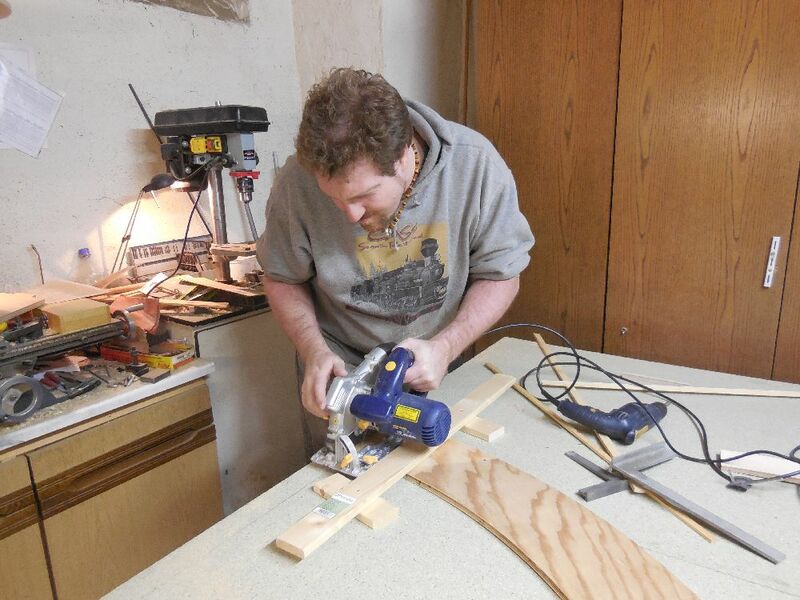 I made the hardware, while my dad cut the plywood stripes to size. 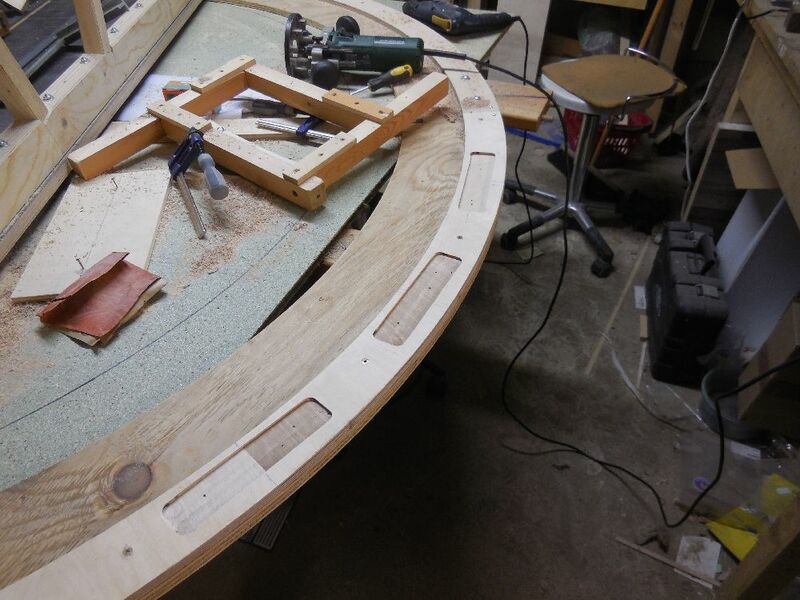 We also pre-drilled the holes for the outer ring. 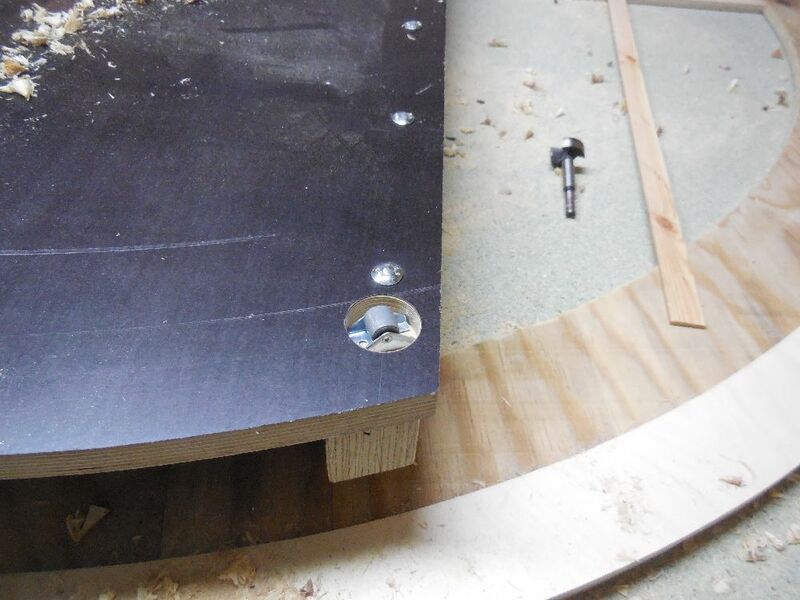 We added M6 threated inserts at all places, where we need to remove screws to take the turntable apart. 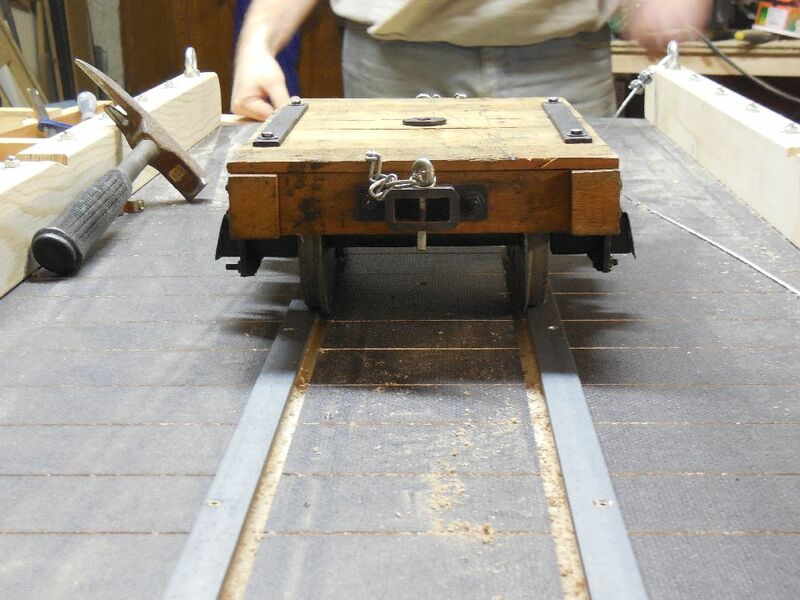 To keep the turntable bridge on the right level and to make it easy to turn the table with a locomotive on it, we added small rollers. 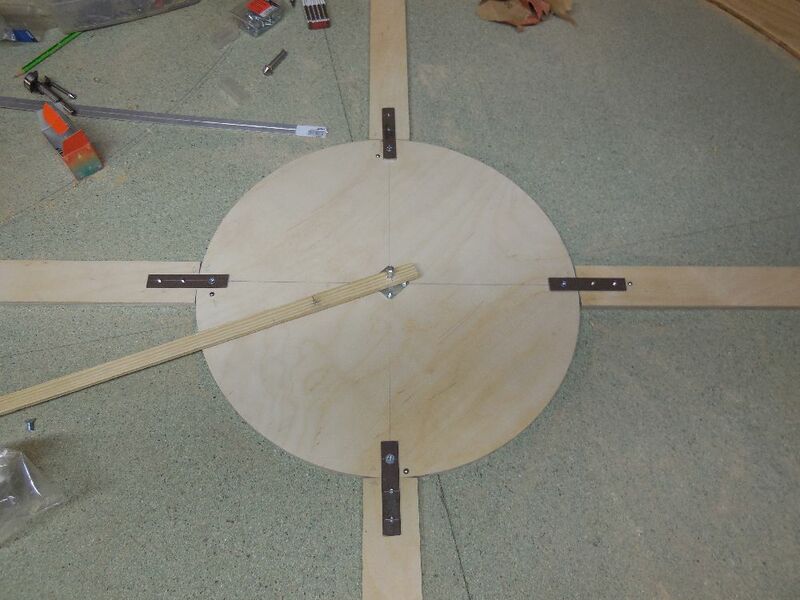 Once the pivot bolt was in place, we could make some test turns. 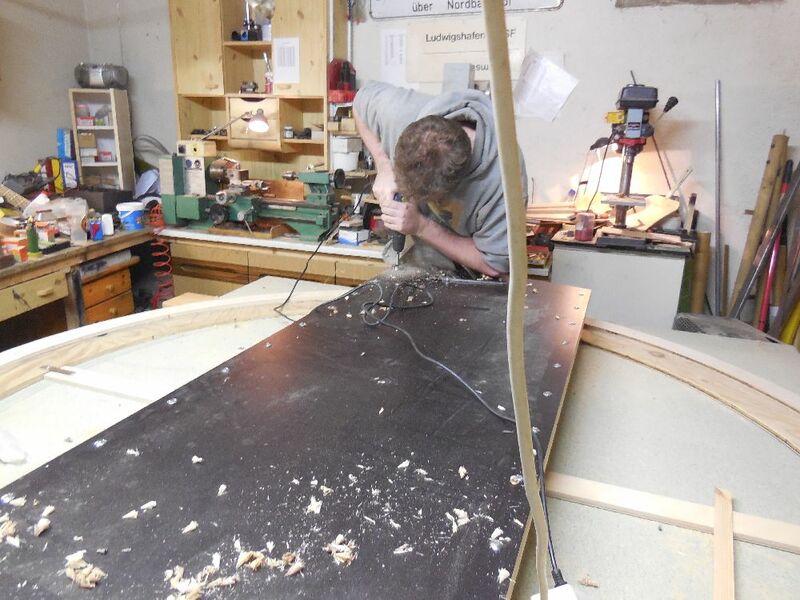 Once the pit was complete so far, we continued work on the bridge. 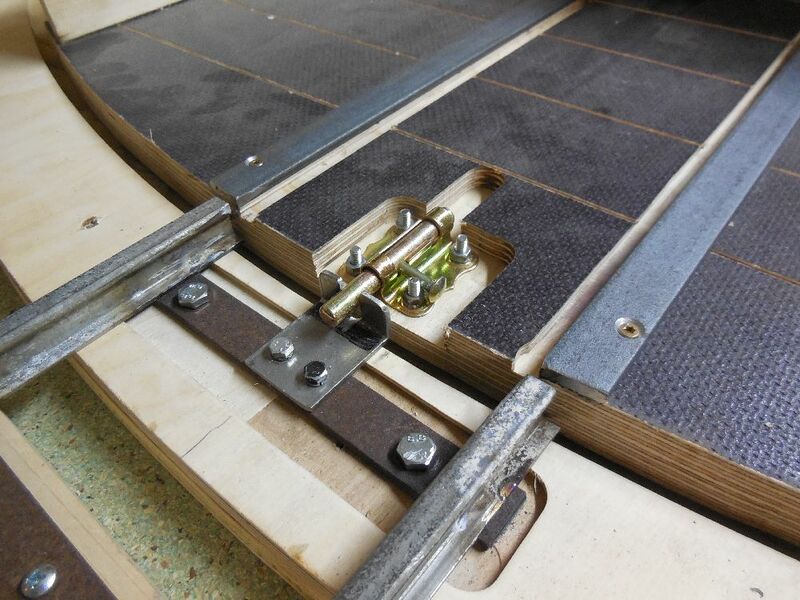 After cutting two grooves with the router, we added rail heads from 20x4mm steel bar. 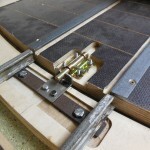 We cut pockets between the rails for slide bolts that will be used to lock the turntable at the connecting tracks. 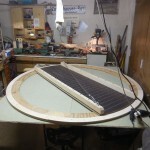 At least two photos of the whole turntable so far. 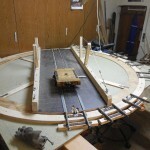 Only the connecting tracks are missing to get the whole thing done.